We’d love your help. 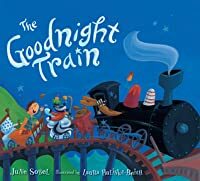 Let us know what’s wrong with this preview of The Goodnight Train by June Sobel. With soothing, lyrical words and magical illustrations, June Sobel and Laura All aboard for Dreamland! Hold on to your pillow because the Goodnight Train is taking off. Roll that corner, rock that curve, and soar past mermaids, leaping sheep, and even ice-cream clouds. You won't want to miss a thing, so whatever you do, don't . . . close . . . your . . . eyes! To ask other readers questions about The Goodnight Train, please sign up. First sentence: The Goodnight Train gets set to roll. It's being shined and filled with coal. Wash the cars off with a hose. Scrub the engine's dirty nose. Scrub-a-dub! Scrub-a-dub! Toot! Toot! 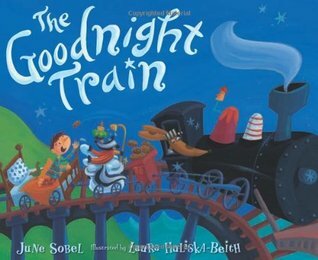 Premise/plot: The Goodnight Train is a bedtime book for little train lovers. It's written in rhyme. The text is silly, but the illustrations are even sillier perhaps. What a cute rhyming story to read to kids before bed. My nephew giggled as I read it to him, especially when I actually yawned when I was reading about a character yawning. Love, love, love this adorable good night book! 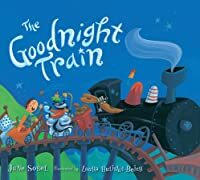 So much more interesting than some of the other goodnight books out there, this one seems to start out faster and louder, eventually becoming softer and slower as the engine moves into its shed to sleep. This book is lovely and unusual--perfect for train-loving toddlers who have everything train, everything Thomas. This is definitely something different that they probably don't have! In my opinion, this book is leagues better than Chugga Chugga Choo Choo, which I recently read to my 3yo son. The rhymes and meters were more fluid, and it was more interesting to me (though it probably didn't make a huge difference to him, as anything with trains is good in his mind). I just hate reading books I don't like, so I'm glad we have this option. I am collecting goodnight books for my kids, and I will keep this one. I really enjoyed reading this one out loud. The variety of train noises was fantastic. The pictures are busy and a bit zany. The images don’t all make sense, but it is fun to look at. My son has requested it the last five nights for bedtime. He is going to be disappointed when we have to return it to the library. My absolute favorite bedtime book. The rhyming words are a perfect rhythm to create a sense of cool peace just before bed. HIGHLY RECOMMEND! Rhyming test, more so for really patient toddlers and preschoolers, interesting illustrations. Children getting ready for bed board the goodnight train and ride it all the way to dreamland. Hop on board the bedtime train. With baths taken and teeth brushed, it choo-choos onto to dreamland. Sheep jumping over fences included. This book takes the reader on a magical trip to dreamland by train. One that would be requested night after night by train fans who will enjoy the gently rhyming text and muted illustrations. So clever! I love the sounds the goodnight train makes. The illustrations are fun too! much going on to be calming. There are bright illustrations. Fun rhymes and great illustrations with lots of detail. I can imagine pointing out different elements and doing I spy with my daughter as she gets older and this book could still be entertaining. This is one our favorite nighttime books! An easy read and my toddler loves the pictures. This is a picture book that was published in 2006. I thought the illustrations were really great in this book and could be used in the classroom as a perfect read aloud story. We bought this at the railway museum in Savannah, Georgia as a memento from Andrew’s time working there in college, helping to restore trains! My son and my nephew both enjoy this as a going to bed book. They enjoy the pictures and the sounds. The story is strange and disjointed, but the illustrations are cute, and the repetition of sleepytime terms is effective. Such a cute rhyming book. The illustrations are the best too. The goodnight train gets set to roll. It's being shined, and filled with coal... that looks remarkably like cookies or cinnamon rolls--yum! This bedtime story board book is delightful, with the children's beds and a bathtub for the skunk making up most of the train's cars. Anthropomorphized animals are the train's conductor, porter, etc. The pajama-clad tots ride the train up the mountain, through the tunnel, around the town, across the plains and fields, until everyone is asleep and arrives hom The goodnight train gets set to roll. It's being shined, and filled with coal... that looks remarkably like cookies or cinnamon rolls--yum! This bedtime story board book is delightful, with the children's beds and a bathtub for the skunk making up most of the train's cars. Anthropomorphized animals are the train's conductor, porter, etc. The pajama-clad tots ride the train up the mountain, through the tunnel, around the town, across the plains and fields, until everyone is asleep and arrives home. What we love about this book: Trains; text includes high-interest train sound effects that are well scripted; good rhyme scheme and rhythm; the structure really makes sense for bedtime. Challenges: Illustrations are gorgeous, but there's a lot going on and it may be too much for some kids to track. I review books for children from the perspective of a parent of kids with autism. The review above is the last part (my summary) of a longer blog post about this book and three other bedtime books: What we love about this book: Trains; text includes high-interest train sound effects that are well scripted; good rhyme scheme and rhythm; the structure really makes sense for bedtime. A great story to read at bedtime. Readers will love following the train through each page of the story as it heads to sleep. The illustrations are whimsical and the colors are true to the story, keeping with the theme of bedtime with the dark colors and blues all throughout the pages. The storyline is good for younger children, but will entertain older children as well. This is a pretty cute board book and I love this deep shade of blue that is used again and again through out the story. Follow the rhythm and rhyme as it lulls and guides a little one to a restful sleep. With the capability of sharing the getting ready and saying goodnights this is a fun one that could be used over many a night for bed or naptime.